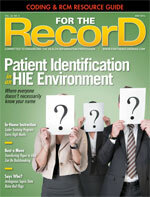 Over the past few years, the concept of interoperable EHRs has gained significant traction. One of the main reasons is the Centers for Medicare & Medicaid Services’ (CMS) meaningful use incentive program, which has spurred the adoption, implementation, and use of HIT tools. In addition, the HITECH Act has sought to improve health care delivery and patient care through HIT investment by providing incentive payments for eligible hospitals and providers that meet certain criteria. As of January, the US government has dispersed more than $21.9 billion in meaningful use incentives. According to the CMS, approximately 89% of all eligible hospitals have received EHR incentive payments, and as of the end of February, 458,137 eligible hospitals and professionals were participating in the meaningful use program. These statistics demonstrate health care providers and hospitals’ commitment to integrate HIT into their care delivery. Despite the success of incentive programs, a large question remains up for debate: Can all these HIT systems effectively communicate with one another, share information, and enable decisions to be made based on the data collected? In other words, are the systems interoperable? Despite interoperability’s benefits, health care providers and organizations should not pursue it solely for its own sake. Rather, the focus should be on how it will boost health outcomes. Because determining whether a system is capable of interoperability is a complicated process, providers and hospitals, not HIT vendors or other nondaily users, must be the ones to decide which systems to connect. As HIT matures and care delivery and payment models focus on quality rather than quantity, it will become critical to leverage only those resources necessary to connect essential systems to achieve the desired outcomes. The chief challenges of developing interoperable systems are the clinical and business processes surrounding data capture, use, and exchange for patient care. Emphasis must be placed on meeting quality-of-care goals while focusing less on a proscriptive approach. As part of this strategy, industry stakeholders must collaborate to determine what works best to achieve the stated standards. The CMS and the Office of the National Coordinator for Health Information Technology (ONC) have established several programs, which require interoperability, to facilitate the acceleration of health information exchange (HIE). As the pace of regulatory burden increases because of initiatives such as ICD-10-CM/PCS, meaningful use, and other quality reporting programs, federal agencies must consider an approach that utilizes public/private partnerships rather than a process that resides within a regulatory framework. The ONC has conducted substantial work in the area of standards and interoperability. For example, its Standards and Interoperability Framework initiative hosts a portfolio of work accomplished through the development of pilots used to demonstrate the ability to exchange health information, the Nationwide Health Information Network, and the DIRECT Project. Although these programs support the need for data exchange, they have limited functional ability. Much also has been accomplished through the work of voluntary, consensus-based standards organizations to advance and address the need for guidelines that can accelerate the ability to exchange health data. Building on the ONC’s work and the widespread support of standards bodies to identify modular and specific standards develops the flexibility for the continuous innovation needed to support current and future data-exchange demands. To further the work of standards bodies and support continued adoption of these guidelines, the Standards and Interoperability Framework convenes industry stakeholders to address interoperability challenges, the provision of support and testing tools, and the development of use cases that are scalable based on users’ needs. The HITECH Act’s intent is to address the need for technology optimization within health care by promoting HIT adoption, implementation, and use. It also serves to establish a baseline from which work must be accomplished to ensure systems can communicate. But how can this continue to be an ongoing concern if providers and hospitals find it difficult to successfully exchange information with one another? As the health care industry moves beyond the HITECH Act, a sustainability framework by policy makers and successful HIE organizations that relies on interoperability as a critical element can help serve as a baseline from which resolutions can be developed. • EHR and HIE adoption and optimization: Once HIT systems are running smoothly, determine which health care entities must exchange data in order for the information to follow the patient through the care continuum. • Use of standards: The ONC Standards and Certification rules list common content, format, and structured data standards as certification requirements for HIT systems. These data then are used to report meaningful use requirements. • Continued support through financial and clinical incentives: Aligning with the provision of incentives to promote HIT adoption, implementation, and use is the need for new payment and delivery system models. As the health care industry transitions from a fee-for-service reimbursement model to one that rewards providers based on the quality of care, it is incumbent on policymakers to enable the exchange of health information through interoperable systems that support information needs. • Privacy and security: The increase in the number of digital health records has raised concerns about the policies and regulations that support health information confidentiality, privacy, and security. HIPAA provides a solid foundation for addressing these issues, with additional protection stemming from the EHR incentive program legislation. For example, ONC standards and certification criteria require HIT vendors to build security capabilities into their products. • Governance: The ONC Framework for Trusted Electronic HIE framework has been developed to support the nationwide exchange of health information. Its principles address trust, business, technical, and organizational issues and help promote good governance practices. Once achieved, interoperability adds power and flexibility to HIT efforts. It’s a complicated process marked by significant barriers but to acquiesce to its challenges would render most of the industry’s prior success nearly meaningless. — Allison Viola, MBA, RHIA, is the vice president of policy and government affairs at the eHealth Initiative.